On their way to a boxing match, four friends witness a murder and need to fight for their lives. From 1993, Judgment Night introduces us to old friends Frank Wyatt (Emilio Estevez), Mike Peterson (Cuba Gooding Jr.) and Ray Cochran (Jeremy Piven). Along with Frank�s rambunctious younger brother John (Stephen Dorff), they go for a �boy�s night out� at a boxing match. Along the way, they get lost in a bad part of town, and they accidentally witness a murder. This puts them in the crosshairs of gang leader Fallon (Denis Leary) and the guys need to flee for their lives. Like Chuck Russell and Renny Harlin immediately before him, director Stephen Hopkins looked likely to use a Nightmare on Elm Street sequel as a springboard to bigger things. Hopkins helmed 1989�s Dream Child and he looked to shoot through the ranks from there. As his next film, Hopkins directed 1990�s Predator 2, and this appeared to stall his career. Both a critical and commercial disappointment, that flick ground the Predator franchise to a halt and clearly impeded Hopkins� career momentum. 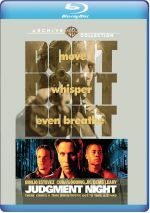 Three years later, Judgment Night became Hopkins� next feature film, and it did nothing to advance his status in Hollywood. While likely a fairly low-budget affair, the flick made a mere $12 million in the US, though apparently it eventually earned �cult classic� status. Which appears to be the reason why I have this Blu-ray. Hey, the packaging calls it �the �90s cult action classic�, so who am I to argue? Whatever fans think of it, I find that Night provides only sporadic pleasures. As a genre effort, it musters decent entertainment, but it rarely threatens to become special. Probably the strongest aspect of the film comes from Leary�s turn as the main villain. We see Fallon as a pure psychopath, but Leary gives him a sarcastic edge that delivers something out of the ordinary. For the genre, at least. Leary�s performance falls into line with his comedic persona, so he doesn�t have to stretch too much, but he still lends a wicked energy to the part that helps make it work. Most other aspects of Night seem more perfunctory, however. Estevez, Gooding and Piven don�t feel especially believable as long-time pals, partly because Piven looks 15 years older than the other two. Surprisingly, Piven is actually three years younger than Estevez, and only three years older than Gooding. Based on appearances, though, Piven plays as someone of a different generation. I can buy Gooding and Estevez as peers, but Piven looks like their uncle. That visual leap of faith aside, the four male leads interact reasonably well. I can�t say any of them impress and they never create a particularly obvious mutual chemistry, but all four are professionals and they give their roles reasonable depth. As for the action, Hopkins manages to move along the tale at a decent pace. While not quite as relentless as it probably should be, Night still pushes matters along well enough to keep the viewer occupied. None of these factors make me agree with the notion of Judgment Night as any kind of classic, cult or otherwise. That said, it creates a mostly entertaining genre flick. Judgment Night appears in an aspect ratio of approximately 2.40:1 on this Blu-ray Disc. Though not great, the image seemed more than satisfactory. Sharpness was largely positive. A few low-light shots appeared a little on the soft side, but the majority of the movie came across with good accuracy and delineation. Colors seemed more than adequate. Night went with a heavily orange/amber-influenced palette, one that included some chilly blues as well. The hues appeared fine within those choices. I also thought that the DTS-HD MA 5.1 soundtrack of Judgment Night worked nicely, as the soundfield maintained a reasonably active and engaging affair. During the film�s quieter scenes, the forward channels dominated. They showed good stereo imaging for the score and also offered realistic ambience. Not surprisingly, this movie kicked to auditory life during its occasional action scenes, and those offered appealing use of all five channels. The elements seemed appropriately located and they blended together nicely. The surrounds added a fair amount of unique information and meshed together in a positive way. Audio quality appeared solid, with dialogue that came across as natural and warm. Music seemed bright and vibrant, as the score presented clear highs and tight low-end. Effects packed a good punch, so those elements appeared distinct and vivid. They lacked problems related to distortion, and they demonstrated deep and rich bass response. Overall, the soundtrack of Night worked well. No extras appear here � not even a trailer! At no point does Judgment Night threaten to turn into a classic. Nonetheless, it manages enough action and tension to make it a mostly engaging action affair. The Blu-ray comes with generally positive picture and audio but it lacks any supplements at all. This becomes a perfectly watchable thriller.